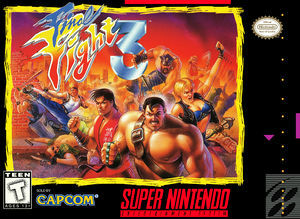 Final Fight 3, released in Japan as Final Fight Tough (ファイナルファイト タフ), is a side-scrolling beat 'em up by Capcom. It is the second sequel to Final Fight released for the SNES, preceded by Final Fight 2. Following the annihilation of the Mad Gear Gang, a new criminal group named the Skull Cross Gang emerges as the new dominant criminal organization in Metro City. When Guy returns to Metro City from his martial art training to become reacquainted with his friend Mike Haggar, the Mayor of Metro City, the two are suddenly informed that the Skull Cross Gang has started a riot in the downtown area of the city. Joined by Lucia, a detective in the Metro City Police'​s Special Crimes Unit, and Dean, a street fighter whose family was murdered by the Skull Cross Gang, Guy and Haggar must once again save Metro City from its newest menace. The graph below charts the compatibility with Final Fight 3 since Dolphin's 2.0 release, listing revisions only where a compatibility change occurred. This page was last edited on 3 December 2017, at 16:04.